An exoskeleton may help Lowe’s Home Improvement workers stock shelves with fewer back injuries. The company is conducting a trial of the technology in Christiansburg, Virginia. 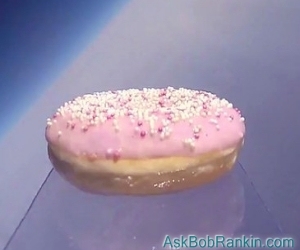 Would you eat a donut that travelled 97,000 feet into space, and then returned to Earth? A donut shop in Kansas City, Missouri has the item on display, in case you're that hungry. We may have 7 million drones zipping around by 2020. The FAA, NASA, and industry players are developing an air traffic control system for them. Shadow Brokers, the hacker outfit behind the worldwide Wannacry ransomware assault, says it will release new zero-day exploits to others who subscribe to its “malware as a service” program. Subscribers would then create new malware based on the exploits. "Not dead yet." The new Ektra phone from Kodak (yes, that Kodak) has a souped-up camera designed for “hipster photographers.” It runs Android 6.0 and works with AT&T or T-mobile. A Denver woman did not fall for a phishing email that purported to be a digital parking ticket, and neither should you. Who says hackers are heartless? A Taiwanese victim of the Thundercrypt ransomware emailed the hacker “help line” to explain that he is too poor to pay the ransom. Surprisingly, the hackers decrypted his hard drive free of charge. Over 200 art books are available to download, print, and enjoy courtesy of the Guggenheim Museum. If you had purchased $100 worth of Bitcoin seven years ago, it would have been worth $72.9 million on May 22, 2017. USB-C ports were invented to allow consumers to have one charger for all their devices. But they can actually cause problems and confusion. Dieter Bohn explains the problem, and why Microsoft didn't include USB-C ports on its latest Surface laptop and tablet. The U.S. Supreme Court has ruled that patent trolls must sue people in their home jurisdictions, putting an end to the “forum shopping” that made one Texas district court the favorite of patent trolls. Most recent comments on "Geekly Update - 24 May 2017"
EDITOR'S NOTE: Done, thanks for the comment! gg pence: Thanks much for your excellent comments. They give all of us something to think about if this idiotic idea is ever attempted. You can likely guess the thoughts of those of us taking cautionary stances on the latest land-based, self-driving vehicles that are always in the news. Fly Me! No... Tanx. I fly the 737 for a living, so I watched the video embedded in the linked CNBC story with some considerable interest. As I suspected before I hit play, it did *not* show the robot landing a plane. It showed the robot manipulating the speed knob, flap lever, autobrake knob, landing gear lever and thrust levers. Those are what I would call "trained monkey" tasks, not flying. For a routine landing in calm wind, doing each of those things in the right sequence could be programmed with simple "IF, THEN" logic. Giving the robot a motion path for each control manipulation is a very basic industrial automation task. There's nothing at all revolutionary, or even evolutionary, here. The aircraft's autopilot performed the landing and its autobrakes brought it to a stop. The video was carefully edited not to show when or how the autopilots (two are used in parallel for the autoland function) were engaged. Did the robot do it, or its human masters? Why did Aurora edit this out of the video? What wind conditions were programmed into the simulator? It must have been calm or a direct headwind, as there was no evidence that the robot had control on the rudder, brakes or nose wheel steering, yet the plane rolled out straight down the runway. Simulators, like real planes, are unforgiving of poor technique; failure to apply crosswind corrections will result in what accident investigators call "departing the paved surface." Finally, the robot took no notice of the Master Caution light that illuminated during the approach (at about 1:30 in the video). In this case it appeared to be an AIR COND (air conditioning) annunciation, so making no immediate response was probably acceptable. Not all fault annunciations can be so blithely ignored. When the robot can analyze a radar picture in combination with surface wind conditions, reports from preceding aircraft and current flight conditions to determine whether it's safe to continue an approach into a windy, rainy airport at night, then manually fly the plane to touchdown, on centerline, in the first 1,500' of runway, in a 25 knot gusting crosswind, then I'll be impressed (and concerned for my future employment). Until then I'll take stuff like this for what it is: a publicity stunt. Thanks for the detailed professional opinion, Joe. It was a fascinating read for someone like me who flies semi-regularly.